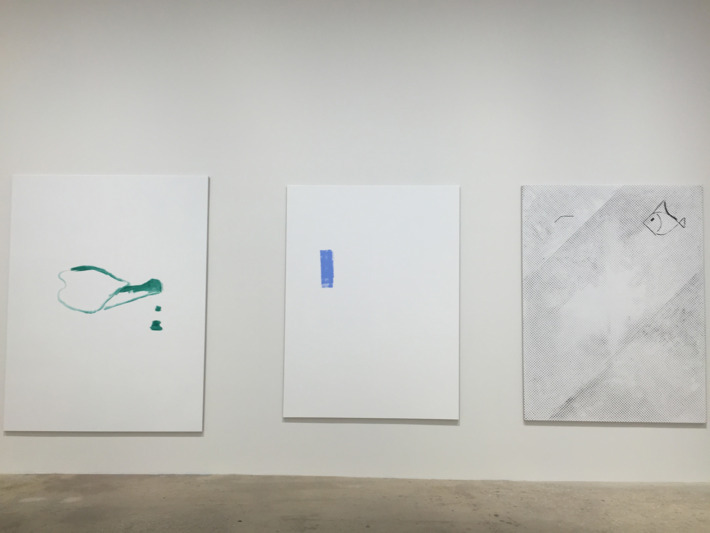 There were 37 paintings in Michael Krebber’s Greene Naftali Gallery show that closed Saturday. I thought every canvas in that overhung exhibition was mundane, lazy, just a riff on riffs Krebber has been doing for a decade or so. But with none of the psychic juice or intellectual jazz. Just vapid variants of the look-alike Crapstraction we see around us, what’s now known as Zombie Formalism, the perfect name given to it by artist Walter Robinson. What makes this show worth thinking about is that Krebber isn’t another high-priced version of this place-holding art. Indeed, this 61-year-old German is an original instigator of it. And comes with pedigree. Loads of it. As a long-time assistant to the late, great Martin Kippenberger, his art was thought to have Kippenberger-esque cred, attitude, and style — sort of like the way the children of celebrities can be seen sooner as stars. About 12 years ago, Krebber’s art did seem tough, important, pressing, filled with criticism — and made a lot of psychic sense. Having been attacked by bin Laden, America and the Coalition of the Willing responded with its own war machine, bolts of bad electricity coursed through the world, and in art this chaos triggered a kind of shocked tribal retreat from hard nationalisms and the certainties of ideology. Simply presenting art that wanted to turn inward and have conversations with other art seemed radical, a way to drill deeper into how art might get through this isolating eclipse. No one wanted to make art about beauty; every artistic move grew self-conscious, was scrutinized and filled with irony — and the awareness that every mark, color, shape, and form existed within this new global clash of civilizations. The result was a turn toward abstraction and precincts beyond language — an apt visual equivalent to where the world lurched. The 2006 Whitney Biennial’s most memorable moment was Urs Fischer’s hole blasted through the museum wall and the sight of a gigantic photorealist self-portrait of artist Rudolf Stingel lying depressed in bed. (Another originator on hand was the late Steven Parrino.) We were all together in this specter of war but alone at the same time. What followed was a stripping down of art, a tearing apart, a piecing-together investigation into destruction, process, obfuscation, anonymity, anything not to go along with official doctrines of art and beauty — in short, a new anti-content away from the market and history. These new beauties grew. The problem, however, is that after it all fell apart with the 2008 market collapse, a paradox arose. The art market just got stronger. Much stronger. Painting, especially, became a safe place to park money, make money, all while gaining social cache. Art students everywhere, swamped by tuition debt but schooled in theory and the coolness of Krebber and others, considered painting not as an escape from the market but maybe an escape into it. There have never been more uneducated collectors shopping for art that looks like other art and never more money to shop for it. Which brings us back to Krebber. To his credit, I don’t know what the guy even looks like, or where he lives, or anything about his lifestyle. Even at his most lame, I can say that he still must really mean what he’s doing, as there’s not much evidence that he’s doing anything else. Good for him. And good for him and his compatriots for making money. It’s just that his paintings are now only illustrations of an old idea of what painting was for a very brief period at the turn the millennium. 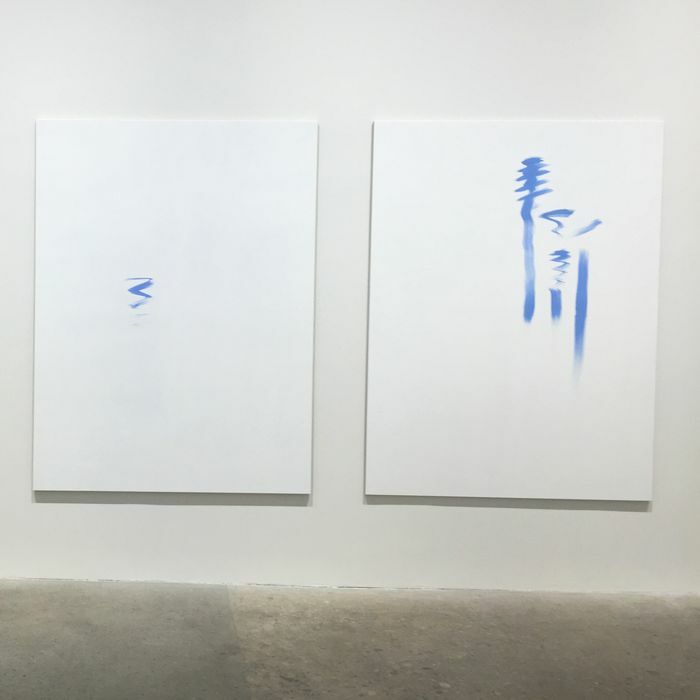 In this case, some paint rolled-on haphazardly over part of a stark-white canvas. This tells collectors: “See; I am driven to make art even as I know art is a contradiction in this time of money.” There are the typical ready-made references to gesture, ground, composition, yadda-yadda. All academic. There are squiggles sometimes, maybe Christopher Wool–like black screen, or Sigmar Polke–like dots here and there. Even the requisite Warhol-ish smearing skid marks. But these lazy paintings aren’t committing any crime. There were a lot of other worse shows up at the same time. Like I say, Krebber helped point the way through some dark times. I bring him up because he’s still so revered in art school. It’s disturbing to think that instructors who came of age in the heyday of Krebber, who practiced this sort of art of formalist withdrawal and investigation, are still teaching it and other highly academic approaches to painting, especially as relating to the constant revivals of formalist art from the 1960s and 1970s. It’s fine for these artist-instructors to revel in that time of their youth and the rediscoveries of the youth of their teachers. That opened doors for them in the late 1990s and early 2000s. But 15 years on, today’s students might want to turn the page from this sort of diluted dandyism and sophisticated sampling, gather together in their own tribal circles, and see what fits this time, not try to emulate the revolutions and radicals of the times of their teachers and moments gone by.